Twenty Republicans bucked their party and voted against the health care overhaul on Thursday. 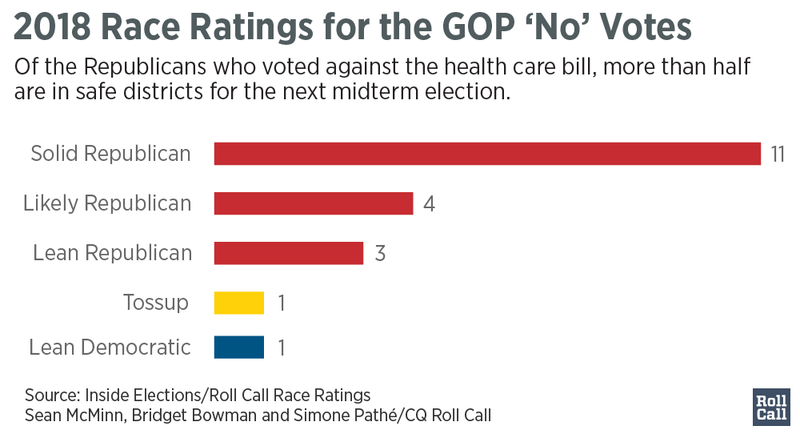 More than half of the members who voted “no” are part of the Tuesday Group, a collection of moderate House Republicans. Nine of the lawmakers represent districts that Democratic presidential nominee Hillary Clinton carried in November. 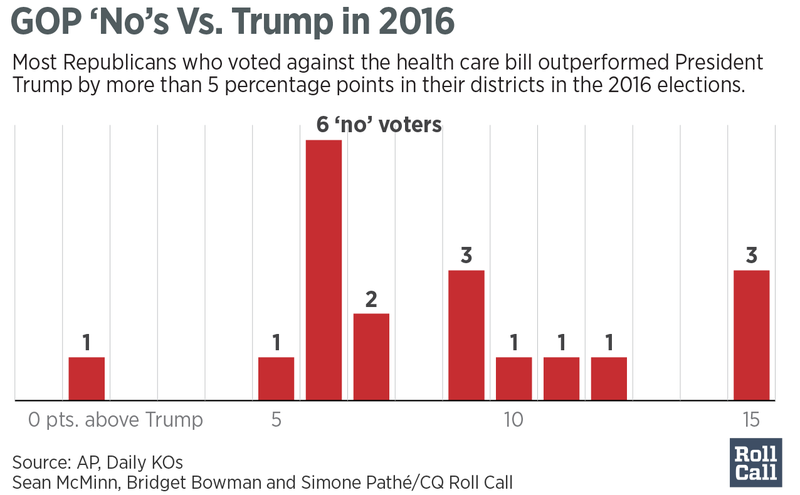 President Donald Trump carried the districts of 11 of the members voting “no.”. But all of the lawmakers outperformed Trump last fall. Fourteen of the “no” votes are Democratic Congressional Campaign Committee targets. Five of the lawmakers are also part of the National Republican Campaign Committee’s Patriot Program, which assists members in tough races. Arizona Rep. Andy Biggs: The freshman lawmaker was the only member of the Freedom Caucus to oppose the bill. He hails from the safely Republican 5th District where he overperformed Trump by nearly 7 points last fall. Biggs benefited from the Club for Growth’s support in a 2016 primary, but it remains to be seen how outside groups will treat the conservative holdout. The club announced its support for the Meadows-MacArthur amendment last week and said Thursday it has no plans to oppose Biggs for his vote against the bill. Inside Elections with Nathan L. Gonzales rates his race Solid Republican. Colorado Rep. Mike Coffman: Also a Tuesday Group member, Coffman was leaning toward voting ‘yes’ on the original version of the bill in March. Hours before Thursday’s vote, he announced he was concerned that some Americans with pre-existing conditions wouldn’t be covered under the Meadows-MacArthur amendment and he wasn’t willing to support a bill without seeing a CBO score. A perennial Democratic target, Coffman represents a suburban district outside Denver with a diverse population that voted for Clinton by 9 points. He overperformed Trump by nearly 10 points, but he’s once again at the top of the DCCC’s target list, and the NRCC added him to the Patriot Program earlier this week. Inside Elections rates his race Leans Republican. Virginia Rep. Barbara Comstock: A member of the moderate Tuesday Group, Comstock would have had a hard time defending a vote for the bill in a suburban district outside Washington, D.C., that’s a favorite Democratic target. The NRCC included her on its initial Patriot Program list for vulnerable members in February. Her survival likely depends on her ability to distance herself from her party and Trump when necessary. She did that well last cycle, overperforming Trump by 11 points in a district Clinton carried by 10 points. Inside Elections this race Leans Republican. Pennsylvania Rep. Ryan A. Costello: Another Tuesday Group member, Costello represents a district outside Philadelphia that narrowly voted for Clinton last fall. The sophomore, who chairs the NRCC’s Patriot Program, easily overcame a Democratic challenge last year from an underwhelming candidate. He overperformed Trump by 10 points. But Democrats are once again targeting the seat, hoping they can knock him off with the right candidate. Inside Elections rates his race Likely Republican. Pennsylvania Rep. Charlie Dent: A co-chairman of the Tuesday Group, Dent is the rare GOP moderate who’s not vulnerable. He won his seventh term last fall by a comfortable 20-point margin, overperforming Trump by 7 points. Trump still carried the district, which is rated Solid Republican. New York Rep. Dan Donovan: Democrats didn’t seriously contest this Staten Island-based district last year after Donovan won a special election in 2015. He went on to win his first full term by 26 points. Trump did well here, too, defeating Clinton by about 10 points in a district Obama narrowly carried in 2012. But this Tuesday Group member is now one of eight New York Republicans on the DCCC’s initial target list. Inside Elections rates his race Solid Republican. Pennsylvania Rep. Brian Fitzpatrick: A Tuesday Group freshman, Fitzpatrick won the Bucks County seat vacated by his brother by 9 points last fall. He’s a moderate in a district that Trump carried by less than half a point. Democrats are always trying to pick off Philadelphia suburban seats, and next year will be no exception. Fitzpatrick is both a DCCC target and a member of the NRCC’s Patriot Program. His race is rated Lean Republican. Washington Rep. Jaime Herrera Beutler: Another Tuesday Group member, she’s one of three female Republicans who voted against the bill. She’s never been in much danger before, winning a fourth term last fall with 62 percent of the vote. But Trump carried her district with less than 50 percent, and she’s a DCCC target in 2018. Her race is rated Solid Republican. Texas Rep. Will Hurd: The second-term congressman is one of the most vulnerable GOP incumbents, and is among the DCCC targets and NRCC Patriots. Clinton carried his southwest Texas district, while Hurd overperformed Trump by roughly 2 points. Inside Elections rates his race a Tossup. North Carolina Rep. Walter B. Jones: The 12-term Liberty Caucus member does his own thing and isn’t afraid to buck leadership. He represents a solidly red district on North Carolina’s coast, which he won by 7 points more than Trump last fall. Any electoral danger Jones would face for his vote would come in a primary. He secured the GOP nod by less than 6 points in 2014. But two years later, he easily dispatched two primary challengers. Plus, the Jones names goes far in this district; his father represented the same area for 26 years. Inside Elections rates his race Solid Republican. Ohio Rep. David Joyce: The Ohio Republican is not a DCCC target. Trump carried Joyce’s GOP-leaning district in 2016 but the Tuesday Group member outperformed him by 9 points. Inside Elections rates his race Solid Republican. New York Rep. John Katko: The second-term congressman is a DCCC target and also part of the NRCC’s Patriot Program. Clinton carried his upstate New York district, but Katko overperformed Trump by 15 points. Katko has raised concerns about the bill’s effect on coverage costs. Inside Election rates his race Likely Republican. New Jersey Rep. Leonard Lance: The fifth-term congressman represents a district that Clinton won in 2016, making him a DCCC target next year. He outperformed Trump by roughly 5 points last November. Like other House Republicans, Lance has faced questions about the GOP’s health care plans at a recent town hall meetings in his district. The Tuesday Group member touted his position that lawmakers should repair the 2010 health care law, which differs from the GOP mantra to “repeal and replace.” His race is rated Likely Republican. New Jersey Rep. Frank A. LoBiondo: The Tuesday Group member, first elected in 1994, is one of the Democrats’ targets in 2018. He’s an original opponent of the bill, saying last week that no one in his district liked it. Trump won his district in 2016, though voters chose Obama in 2008 and 2012. In 2016, LoBiondo outperformed Trump by nearly 7 points. His race is rated Solid Republican. Kentucky Rep. Thomas Massie: He is one of the few conservatives who was not swayed to support the bill by an amendment allowing states to waive some insurance coverage requirements. Massie is not a member of the Freedom Caucus but votes with the most conservative House members. For Massie, the GOP bill did not fully repeal the 2010 law. Massie overperformed Trump by 6 points. Inside Elections rates his race Solid Republican. Pennsylvania Rep. Patrick Meehan: A member of the Tuesday Group, Meehan is a DCCC target in 2018 since Clinton won his southeastern Pennsylvania district. But the fourth-term congressman outperformed Trump by roughly 12 points in November. His race is rated Likely Republican. Washington Rep. Dave Reichert: The seven-term member, another Tuesday Group moderate, was supportive of the original GOP bill in March. He came out against the latest version shortly before Thursday’s vote, saying it did not “provide the essential protections” he needed to support it. Reichert easily won re-election last year, but Clinton narrowly carried his district, making him a DCCC target in 2018. Inside Elections rates his race Solid Republican. Florida Rep. Ileana Ros-Lehtinen: The veteran congresswoman recently announced she will retire after this Congress, increasing Democrats’ chances of flipping her district, which Clinton won in 2016 by nearly 20 points. Ros-Lehtinen, in her 14th full term, said the amendments to the GOP bill were “fig leaves,” adding, “I feel bad for all the vulnerable members.” Ros-Lehtinen outperformed Trump by nearly 16 points last fall. Inside Elections rates her race Lean Democratic following her retirement announcement. New Jersey Rep. Christopher H. Smith: The veteran congressman wasn’t on the DCCC’s initial target list and is currently in his 19th term in the House. Trump carried Smith’s district but Smith outperformed Trump by nearly 8 points. His race is rated Solid Republican. Ohio Rep. Michael R. Turner: The eight-term lawmaker wasn’t on the original whip lists as a “no,” but he said in a statement immediately after the vote that he couldn’t support a bill that would “leave our most vulnerable citizens with inadequate health coverage” and that he had repeatedly voiced those concerns to leadership. He represents a safe Republican seat that Trump carried by 7 points. His race is rated Solid Republican. Correction 4:20 p.m. | An earlier version of the story incorrectly identified Rep. Christopher H. Smith as a member of the Tuesday Group. Lindsey McPherson, Erin Mershon and Andrew Siddons contributed to this report.